Jewels Lightweight Queen Champion Ayaka Hamasaki will make the next defence of her title against Japanese legend Yuka “Vale Tudo Queen” Tsuji at Jewels: “19th Ring” on May 26th. The event will take place at Azalea Taisho Hall as the promotion travels to Osaka, Japan for the first time. Hamasaki most recently earned a first-round TKO win over South Korean rival Seo Hee Ham in December and remains unbeaten through six pro fights. Tsuji, a former Smackgirl and Valkyrie champion, returned from a lengthy injury layoff with a decision victory at Jewels: “15th Ring” in July. Hamasaki (6-0-0), a protégé of pound-for-pound queen Megumi Fujii, looks to follow in her mentor’s footsteps by leading a charge for female fighters in Japan. The Abe Ani Combat Club standout became the first Jewels champion in history by winning two fights in one night at “11th Ring” in December 2010, including a close decision victory over Ham. This past September, Hamasaki held off the charge of teen prospect Mizuki Inoue. She returned to the ring in December to face Ham for a second time and walked away with a victory after Ham could not continue beyond round one due to a back injury. Tsuji (23-2-0), along with Fujii, paved the way for many of the current crop of female fighters in her home country. The armbar specialist has faced and defeated many of the sport’s top female fighters at 115 pounds and holds wins over the only two women who have managed to best her. Tsuji lost her Valkyrie Featherweight Championship in a shocking upset to “V.V” Mei Yamaguchi in early 2010 and spent over a year on the sidelines recovering from knee and shoulder injuries. She debuted for Jewels in July and took a convincing Unanimous Decision victory over one of the promotion’s biggest stars, Saori Ishioka. For many years, Japanese fans and media alike looked forward to a showdown between the country’s top two female fighters, Fujii and Tsuji. The bout never materialised, and with Fujii now under contract to Bellator Fighting Championships, it is a fight that may never take place. Hamasaki will take the place of her teacher against the veteran Tsuji when Jewels travels to Osaka for the first time. A win for Hamasaki would solidify her spot as a top-ten pound-for-pound fighter. 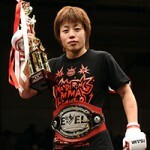 For Tsuji, a victory would earn her both the Jewels title and also a return to a top-three ranking at 115 pounds. Jewels: “19th Ring” takes place on May 26th at Azalea Taisho Hall in Osaka, Japan.